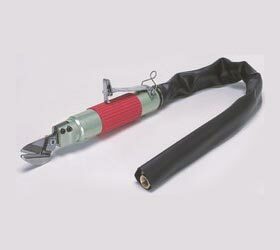 We as a prominent Supplier, Exporter and Importer provide our esteemed customers Nile Air Plate Shears. It is made up with alloy steel. Table and cutting beam are deeply reinforced and fines machine after stress reliving. The interlocked design put the direct support to frame. Thus frames are strain free and eliminate welds at load supports. Thus, the accuracy of machine is never disturbed. "Max cutting capacity” is not definite but just a rough guidance for tool choice.